If I had a dollar for every time someone asked me that question, I could afford a house in England and in the States..hence, my dream life. Every time I mention the royal family, or study abroad, or anything english really, people ask me why I am so obsessed. They say things like "Don't you know it's grey and rainy all the time?" and "Living there is just like living here..what's the big deal?" and I don't even know where to begin most of the time. We shall start with the obvious…those dang British accents. British accents are just adorable. I could listen to a British person talk all day and never get tired of it. I watch British YouTubers talk and am just memorized. It is weird, I know, but I personally think it's amazing. And can I just say how unfair it is that Brits can talk in an American accent so easily but yet Americans sound like they have a speech impediment when they try to "speak British." Also, words like "jumper" instead of sweater, or not finishing a phrase when saying things like "a cuppa" or "stickers on." I love it, but I always want to say "A cup of what?" "Stickers on what?" The people. So many people that I love have come out of England. Margaret Thatcher, Winston Churchill, Harry Potter, Harry Styles (and Liam, Louis, and Zayn), David Beckham, Hugh Grant, Bill Nighy, Robert Pattinson…and also Amy Norris. The music. I mean, Rolling Stones, Vampire Weekend, Arctic Monkeys, The Clash, The Kooks, The Beatles, The 1975, The Cure, The Smiths, McFly, One Direction…(; I just love when I love a band and then find out they're British because to me, it makes me love them even more. The vocabulary. I keep a running lists of my favorites but right now it's arse, blusher, trousers, lads, bird (someone is going to call me their bird even if I have to coerce it out of them), fortnight, and yogurt. Gotta love the way they say yogurt. #iamembarrassing The hats. Why do we not wear hats in America? I have a few, but I don't ever wear them in public because people think I'm crazy. I just want to dress like Kate Middleton…is that too much to ask? Afternoon tea. I don't even drink tea, but I think the idea of wearing a big hat, elbow length gloves, and a fancy dress to go drink it is just too much. Quaint little towns. We have small towns here, but I love the idea of having a town center with a main street and all that. I also like the idea of driving on the left side of the road. I don't understand why they do that, but I like it. The politics. I find the Parliamentary system so interesting. There is so much cool history there and I love it. I get so into the history behind Parliament and the way their system works as compared to ours and it's just so neat. The royal family. Okay, I don't just say this because I grew up loving Prince William and Prince Harry and now I'm absolutely obsessed with Kate Middleton, I say it because I think the royal family does a good job of bringing the country together. I mean, look how excited and united the whole country was for the royal wedding and the birth of the royal baby…that just doesn't happen in America. The history. All silliness aside, I really starting falling for England when I started reading Philippa Gregory's books. I love to read about the previous kings and queens of England and learn about the military and political history there. America is so young compared to European countries and we don't have all the interesting history and architecture..I mean, castles! 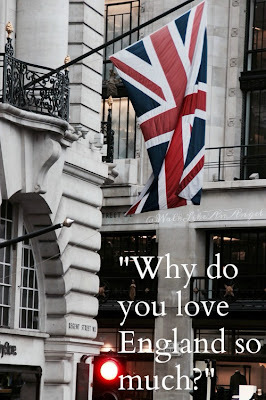 In the end, I love England because I've grown up thinking of it as such a magical, foreign place. It's one of those things where you picture yourself being who you've always wanted to be - crazy, carefree, and full of life - once you get there and it just seems so magical. Like all of a sudden I'll get to Heathrow and my life will begin…and it'll be full of fun parties and romantic days, of course. I've loved reading about it and watching movies made/set there and always said I would go but never actually thought it would happen. Now that is is happening, it symbolizes the fact that I had a goal, never gave up on it or thought I could't do it, and actually made it happen! I cannot wait to be blogging from England and fangirling over all the amazing things I'm doing and places I'm seeing everyday! What is your favorite "must visit" place in the world? I'm glad that you have high hopes for England, and it's a dream for you. Being british myself, I'd say some of those things are not far off, but some things are common misconceptions. I'd hate the thought of you entering England with rose-tinted vision, to find yourself in somewhere you'd feel uncomfortable or disappointed. I suppose if you're going to England to live the lovely British lifestyle, you're better in villages as opposed to cities, but then again that can affect job prospects. Thank you! And yes, I'd say take some of these with a grain of salt as I know that in many ways, England is just like every where else, and I know it's not all accents and high tea all the time! lol. I just love it and think it's an awesome place! I get asked that a lot too. It's my dream to live in London, or at least in a village close by. I like people personalities (even if the conception is that they're cold people) and I really like the cold weather, sweaters almost all year round? yes, please! This made me smile. Sometimes it takes someone's outside view to appreciate what we have going on over here in England and how other people see it. But as Chlo said it isn't all brilliantly British accents, lovely people wearing hats all the time ;) However this year I've decided to explore England a bit more myself, so I'm sure my eyes will be opened to all the stuff it has to offer that I don't already know about after 25 years. I'm pretty much in the same boat as you are and just reading through this post made me smile so much... Next time someone asks me why i'm obsessed with England? I'm definitely showing them this. Oh Sarah, you're too sweet!! Seriously, I really wish everyone in England wore hats and elbow length gloves to afternoon tea - I think we should bring back that style when we go to the Ritz for champagne tea (this is happening - you don't get a choice in the matter). Yey for England - it's that history I miss now that i'm in the US. I know the US has history, don't get me wrong (and I know it has a history way before Columbus "found" America) but it's having castles and huge catherdals and the like that I miss. Also - while you didn't mention it - the British seaside is awesome - fish n chips, candy floss, rock pools, arcades. Perfect! Eeee this post makes me excited for you! My family is going to London for a week this summer (and then Paris) and I'm so pumped for it, I feel like I can't stop talking about it! I could not agree more with this post!! I'm fascinated by the fact that there's so much history in England compared to the US. I'm so excited to hear about your travels and can't wait to live vicariously through you!! Ahh, please do! I can't wait and I'm glad someone will be excited about my excited rambles! Haha it means like stickers on something I think. Like I've always heard people say it like "ooh, it has pretty stickers on too" or something like "It's got buttons on." Stuff like that! This post was so sweet! I think it's great that you love GB and want to spend time here! Chlo is right though, but it's nice that you focused on the positives that us Brits sometimes forget! Nice post and good to read this kind of blogs. really good to see this info. thanks for sharing this post. Wow super post. Really it was a nice experience for me. It was a new information for me. Thanks for sharing this useful information.